The report reflecting activities of Fund of Women Entrepreneurs for 2015. 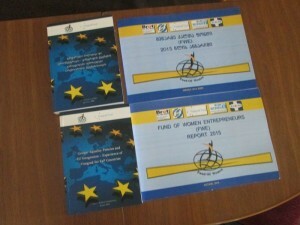 The Fund of Women Entrepreneurs has issued the magazine in which are reflected the activities of fund for 2015. The magazine acquaints the reader with management structure of the fund; internal regulations; to the directions of the project; to activities and the results achieved during the accounting period. The magazine is issued on both languages – Georgian and English. Photo materials are also placed. The fourth issue of the journal reviews the six-month activities performed by the FWE. 500 copies of the journal were traditionally published in two languages -Georgian and English and the activities for the period of July-December is traditionally covered in the heading “News Page”. News about the young girls and middle-aged women’s involvement in educational courses and their employment promotion are available in the headings “Employment” and “Support”. The publication illuminates the photo-collage of the activities in the direction of professional orientation and educational courses. 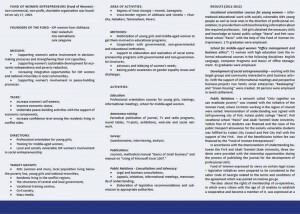 Booklet on the activities implemented by the Fund of Women Entrepreneurs was published. With the help of the booklet readers will introduce the missions, goals and directions of the fund in three languages -Georgian, English and Russian. 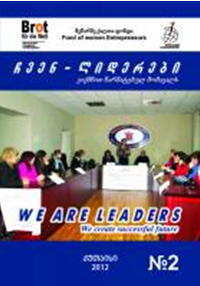 The third issue of the journal “We Are Leaders” was released in a traditional format. Journal’s heading “News Page” is a review of the organization’s activities. Extensive information of the activities performed by the fund is covered in the different thematic headings of the journal: “We Teach”- about the educational events, “Novelty” – about the work of the network “only together we can eradicate poverty” established by the fund and “initiative” – focuses on the ideas and proposals submitted to the parliament on the process of establishing laws. Another innovation of the journal is the articles prepared by the students of Akaki Tsereteli State University, provided with the intership opportunities during the process of publishing the journal. 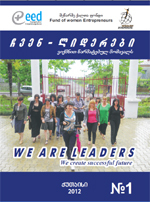 The new issue of the journal “We – leaders” was released. The second issue is the original reflecting the report of the previous year. The information about the performed work by the Fund is traditionally covered in the journal’s headings. The headlines “News”, “We teach”, “Partners”, “Own business,” “Qualification” contain a review of the organization’s activities in the period of August-December 2012 not for the support of social entrepreneurship, but also the training of girls and middle-aged women. “Legal Guide” provides legal advice not only to the beneficiaries. The publication illuminates the photos o these activities. 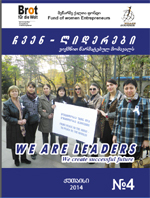 Fund of Women Entrepreneurs published a new journal – “We are leaders”. The first issue was printed in different design and format. In various rubrics readers will learn about the organization’s activities implemented last period. In “Perspectives” we learn about the Fund’s activities and future plans to be carried out. The rubrics “We teach” and “News” about the organization’s educational activities. “Successful” shows the women, who got employed with the support of the Fund. The readers will also learn about the projects and activities, which aim to support the small business among population. The rubric “Qualification” tells about the trainings and conferences on various topics participated by the fund’s employees. A lawyer gives legal advice to the readers. The journal also presents the photographs eliminating the activities of the fund.